Our design proposal for the Barilla Pavilion takes its inspiration from what we believe to be the key values of Barilla: tradition, family and community. 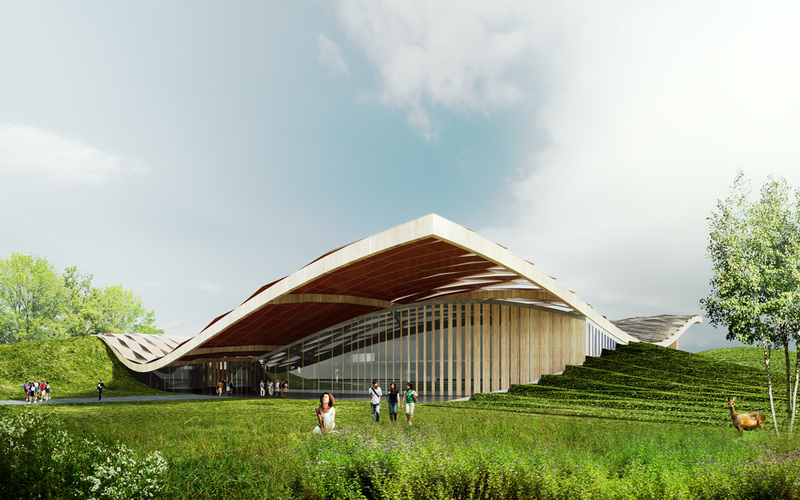 We envision the new addition to the Barilla headquarters in Parma not as a singular building, but a series of pavilions linked together by a path, a journey much like the history of Barilla. It is through this journey that we can create an experience, a sense of place, a destination where different events take place, an adaptable environment that is multifunctional, comfortable, resilient and optimises the use of natural resources. 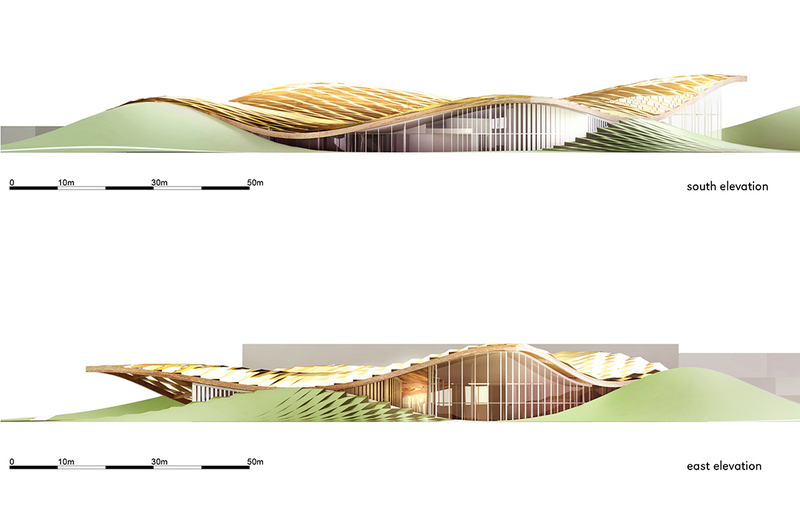 Our design approach begins with the idea of bringing something unique to the existing site, a new topography that defines low as well as high points. 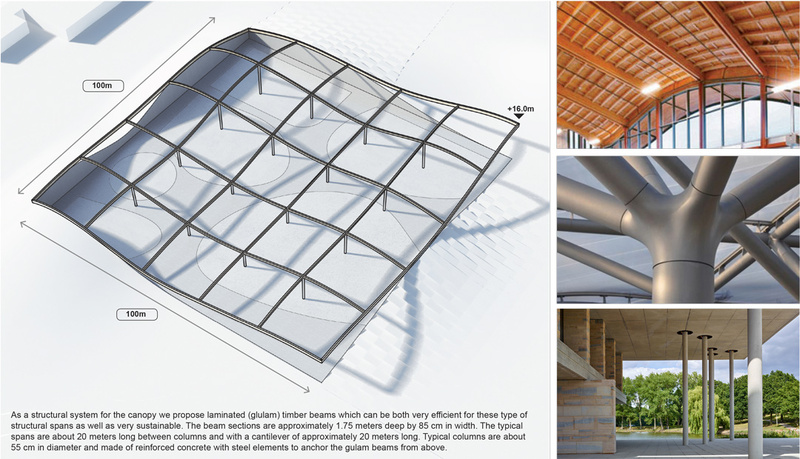 It is on this new topography that we then define the boundaries of the pavilion’s footprint, a covered space that is sheltered by a canopy under which the programme is distributed by its different function. 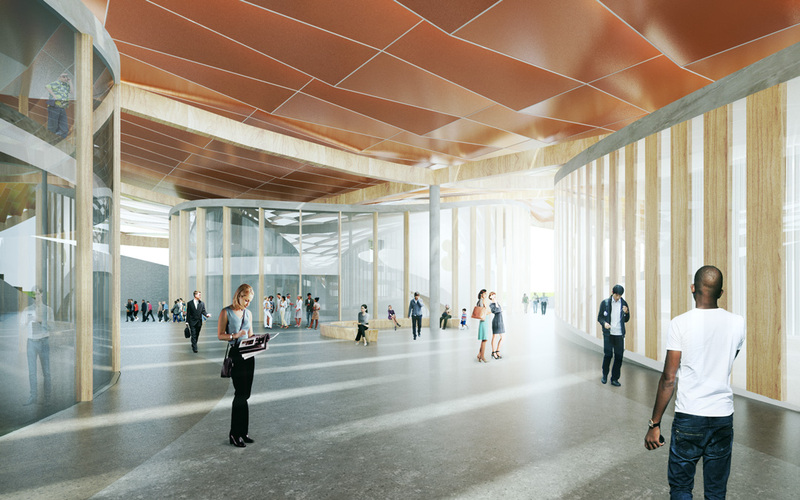 Much like an event space, the new Barilla pavilion acts as a container for new activities, community gathering and exploration..
Barilla Piazza The Barilla Piazza is envisaged as a connector space that links the visitors entering underneath the canopy to all the different pavilions. As well as a linking space, the piazza will offer visitor services, facilities and gathering spaces. Part of this space will offer contemplative areas of quietness and introspection. 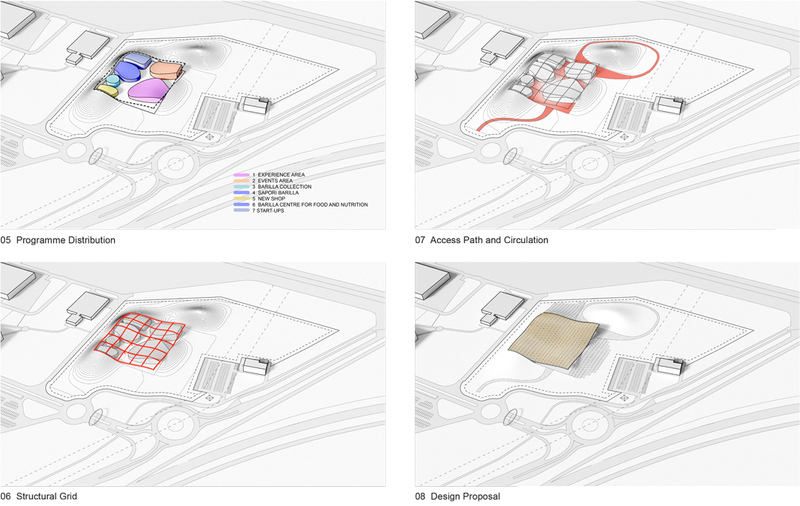 There is a potential for the piazza to connect with landscaped elements of courtyards, gardens and stepped hills. An inclusive but flexible environment, the Barilla Piazza caters for all age groups, disabilities, and provides universal access to all spaces, pavilions and facilities. This will be an inspiring environment that creates memorable experiences. The programme is distributed horizontally as follows: a large Experience Area with a variable height of 14 meters and double height spaces that provide separate semi-enclosed areas for exhibits, displays and digital narratives. 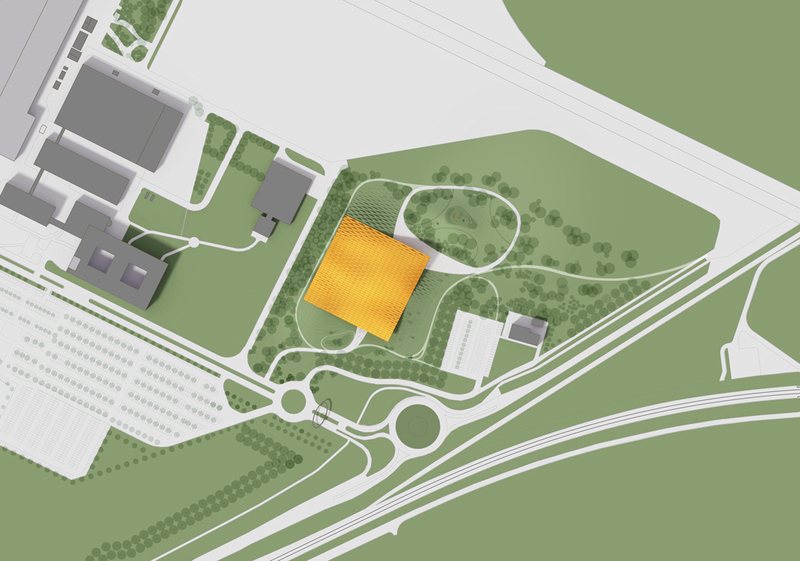 Adjacent to the experience pavilion is the Events Area with a large 400 seat auditorium and 4 separate meeting rooms. 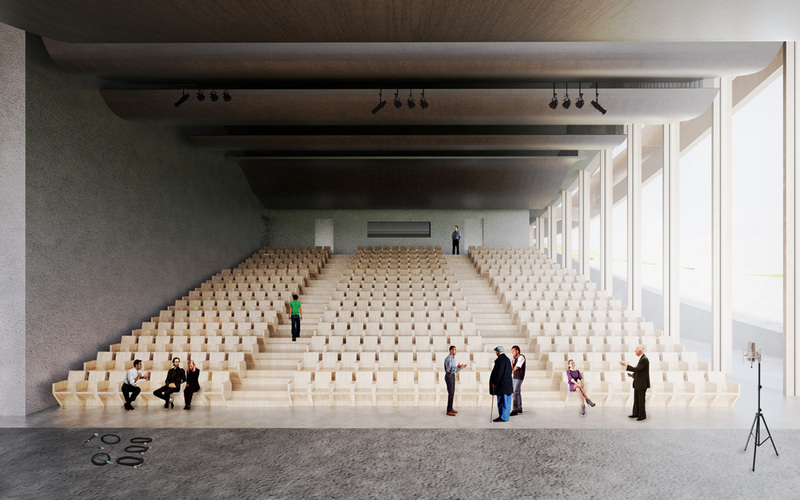 The stage is opened to the landscape and seating is adjacent to a glass wall providing natural light. At the opposite corner and close to the main access is the New Shop. 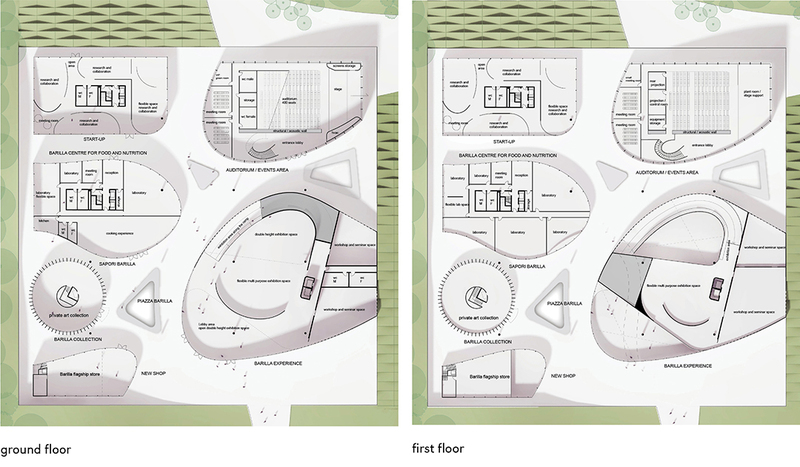 This is a modest, two-storey pavilion with ease of access from the main central space -the hub. The Hub or Barilla Piazza is the central space from which all pavilions can be accessed. This is a covered, opened space that can be completely adaptable for different events throughout the year. 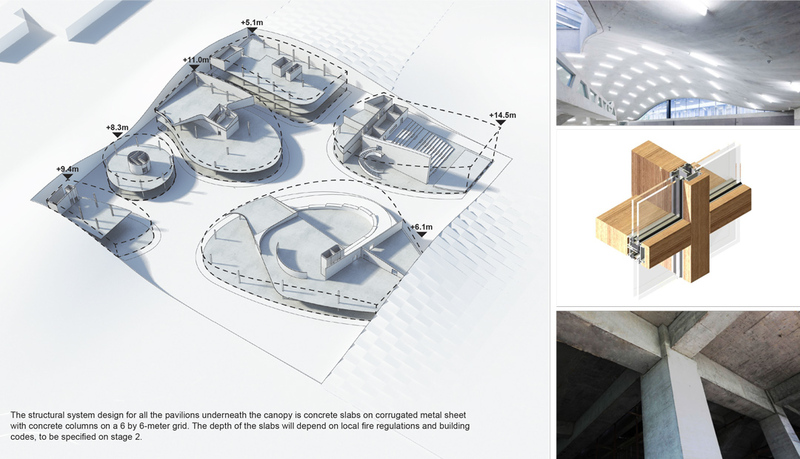 Next to the shop is the Barilla Collection, a vault-like pavilion with the possibility for restricted access. 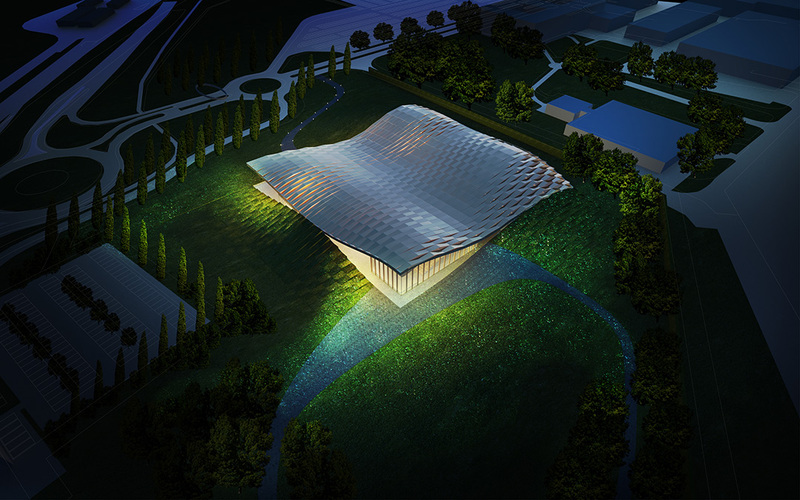 This pavilion has a more enclosed façade than other pavilions and it is equipped with museum lighting and specific temperature for the preservation of the works of art. Following along we find the Barilla Centre for Food and Nutrition (BFN), a large multi-storey research facility that is easily accessible from the site. Same as all other pavilions, the BFN is a glass building and exposed to the public so that visitors can experience the many different parts of the Barilla family and its strong presence in the community. This pavilion also houses the Sapori Barilla, a large restaurant at the ground level. Immediately adjacent to the BFN pavilion is the Start-ups pavilion, a similar multi-storey structure equipped with an open plan layout, flexible meeting rooms, adaptable hot-desking and meeting rooms. 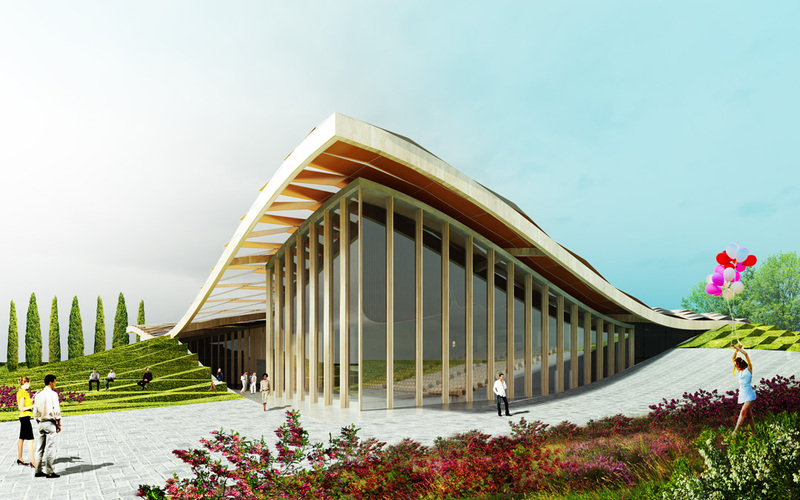 We envision this pavilion as a meeting space for young entrepreneurs to use as a destination and part of the community. 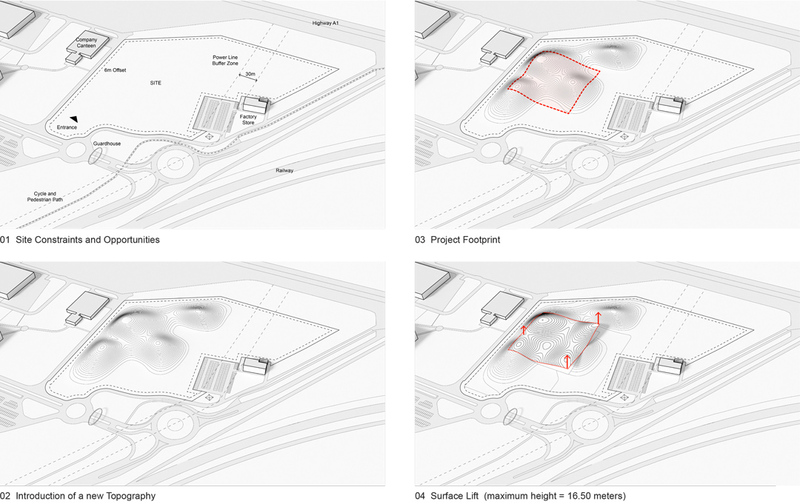 The landscape strategy of our design proposal is perhaps the basis of our design approach as well as our point of departure for the programme distribution. 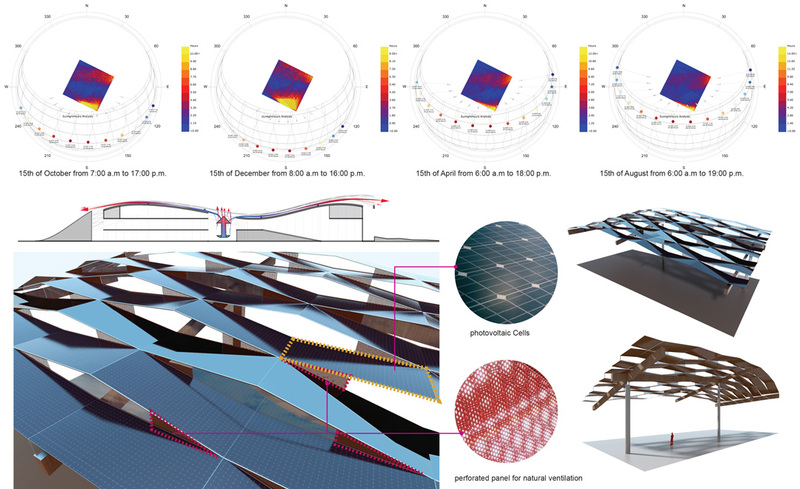 We strongly believe that landscape and pavilion should always be merged into one system, one building. The new topography allows us to define a sense of space, and to provide shelter and a place for discovery, very much like in nature. 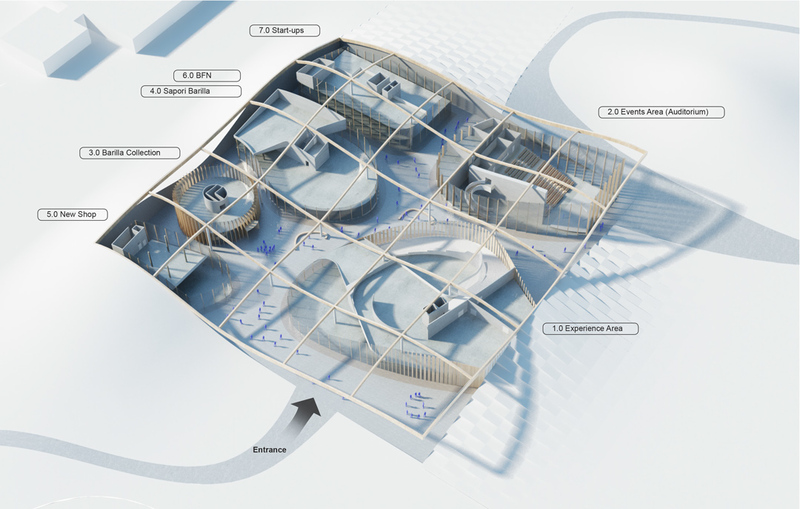 We are interested not only in the space created by the topography but the spaces around it and how they interact with the new Barilla Pavilion. 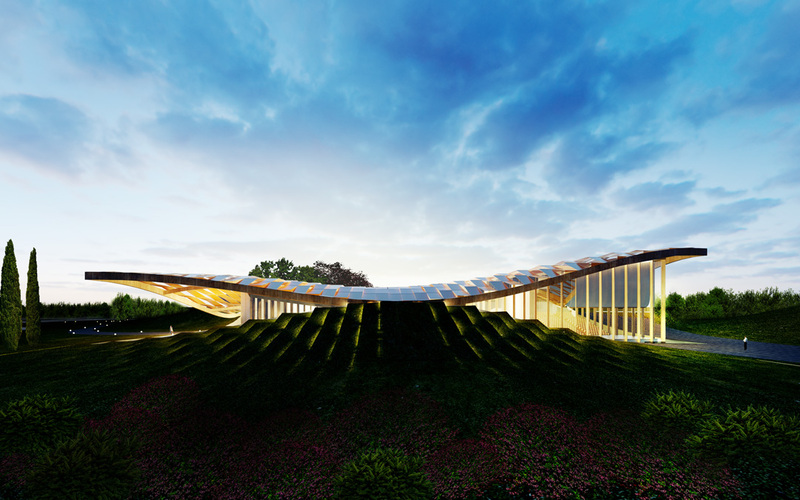 Raising the landscape provides us with infinite potentials for visitor interactions, interesting and unique experiences such as a raised piazza, a stepped hill with seating for an amphitheatre, a valley for gatherings and many more different uses.